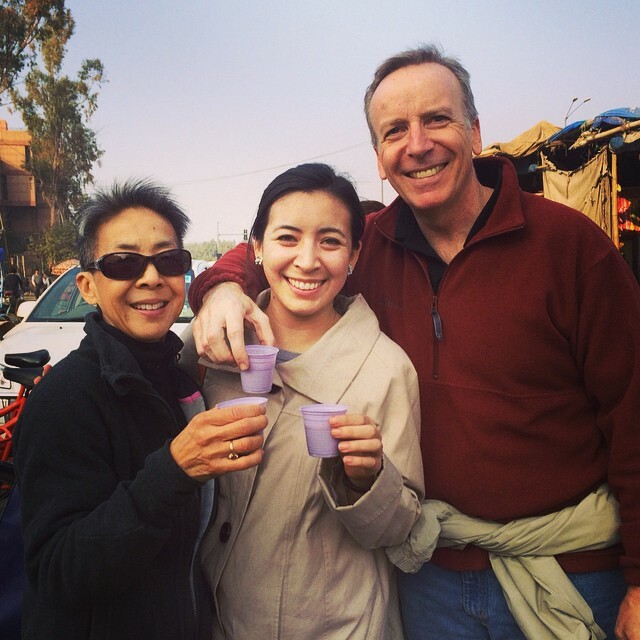 Drinking street chai when visiting our daughter overseas. Our daughter told us that when she returned from overseas she’d like to run a Disney half marathon and wanted to know if we were interested. My wife has had her eye on one of those runs for a while, so she said yes. I have had my eye on my wife for a while, so I said yes. 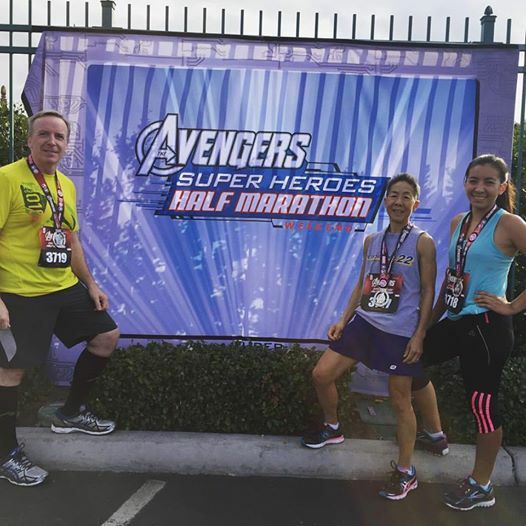 We signed up for the Avengers race scheduled for November. My wife’s usual distance is 12+ miles, so she was ready for it. My usual distance is 6-7 miles so I had to train. After a a few months of hitting 13 miles or so at least once a week I felt ready. 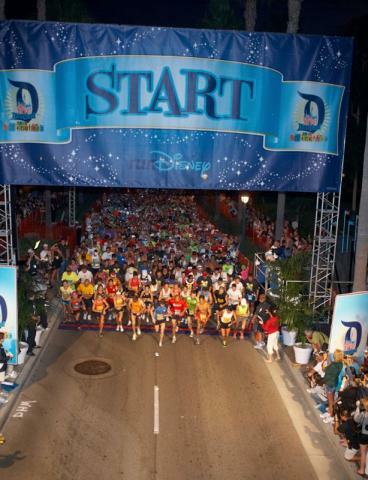 The race started by the Disneyland hotel before dawn. We were directed to our starting area where we ended up standing for about an hour before our group (or “corral”) of runners was released. We took off in a large crowd and ran through California Adventure and Disneyland where the overnight crews lined the course and cheered us on. 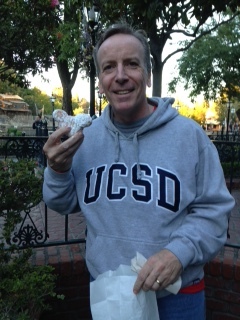 There was a lot of jostling and short spurts of sprinting to try to get clear of the mass of people; my wife and I lost sight of our daughter before we left the parks and hit the streets of Anaheim. Well behind the frontrunners, way back a few thousand people, is where we lined up to start. Can you see us? 13.1 miles is a long way to run for me, and I was not able to keep up with my wife after about mile 6. That was all right. We’d talked about everyone running their own pace in order to feel comfortable for the long haul. 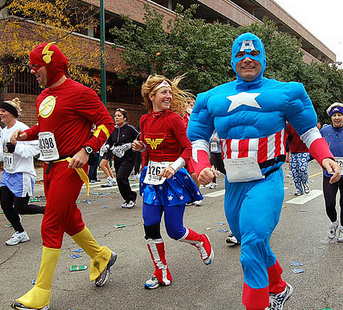 Some people run in costume. We didn’t. After about mile 6 I would not call my own pace comfortable. I had not counted on standing for an hour before the race started or the short spurts in the beginning to get clear of the slower runners and walkers. Legs that shouldn’t have started screaming until well after mile 10 were already asking me whether it was time to go home. Still, we all made it to the end. Our daughter finished in 2:01 and my wife in 2:08. My time was 2:18 but my legs would have told you it definitely felt like they’d been running for more like twice that long. Here we are after the race. As you can see, I’m still standing. The official race stats said I finished 2300/10763 overall, so that’s ahead of 78% of the runners. Of all men in the race I finished in the top 32%, and same when compared to men in my age group. Those aren’t the most impressive statistics, though. The most impressive statistic is that I finished first in my division. Races are often broken into divisions. All runners is the largest grouping, but then you have a women’s division and a men’s division and these are broken down by age groups, such as 50-55 year old men for example. But that’s not the division I finished first in. I define my division much more particularly. And I’ll keep adding defining terms until I am guaranteed to be in first place. That way I’m not merely in the top 32% of men in my age group but the number one runner. I started by adding the condition of being a 50-55 year old man running with family. Then I realized I might not have been the only old guy with family in the race. So how about running with a wife and daughter in the race. But there’s still some probability that another guy might have had that combination of runners. All right then, I’ll go with 50-55 year old men running with a wife and daughter where the man comes in third of the three. But you know what? I’m still not sure that is specific enough to give me the top slot. Here goes: 50-55 year old men named Tim running with a wife and daughter where the man comes in third of the three. There now, that’s my division. Yay! I came in first in my division! It’s interesting how he frames this encouragement. First he says only one person gets the prize, then he suggests everyone is able to run and receive the prize. This is a radical departure from values of the surrounding Greco-Roman culture, where everyone vied for advancement even if came at the expense of others. Paul is here saying that everyone who runs wins. Get that? If you run, you win. But what kind of race course is this scriptural run? It’s a course built by Jesus, the one we get to keep our eyes on throughout the entire race. He has already perfected our faith, which means you can’t help but win the prize. Nothing you do will keep you from winning the race prize. In fact, you are already in the winner’s circle with Jesus. You finished first in your division because your division is defined by Jesus, the one God the Father raised up, and his accomplishments on your behalf. Wear your prize proudly, runner. This entry was posted in Uncategorized and tagged Disney half marathon, heaven, Jesus, run the race, The Avengers. Bookmark the permalink. May we all complete the race of life -properly. p.s. I walked a 5k faster than many who ran. Great post, Tim! I’ll have to make sure my husband reads it, since he is an avid runner. I like those words “the race marked out for us.” We probably all have a different kind of race marked out for us — a different calling, a different set of gifts. All the more reason we need to keep our eyes on Jesus and not on the other runners so that we don’t become discouraged by comparing ourselves with others who seem to be doing so much better than we are! Jeannie, that is the best reflection on those words from Hebrews 12 I’ve ever heard. In Kingston we have a run where the “middle of the pack” runner wins a pair of running shoes. Sometimes it pays to be mediocre although I don’t think this is very Biblical. Middle of the pack is fine with me, Richard, especially if there are free shoes involved. Besides, whenever I hear the phrase “Leader of the Pack” I get this song stuck in my head!